This extensive model covers six types of skin. Healthy skin from the scalp, axilla, and palm or sole, are situated on one side. Represented structures include the subcutaneous layer with fat, dermis with dermal papillae, epidermis, hair and follicles, eccrine and apocrine sweat glands, sebaceous glands, blood vessels, Meissner’s and Pacinian corpuscles, nerves, goose bump muscles, and the erector pili that make hair stand on end. 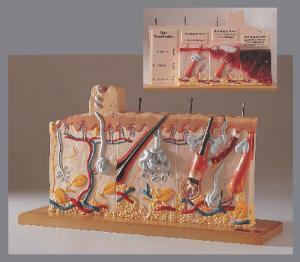 The other side of the model features examples of first, second, and third-degree burns, illustrating the increasing severity of damage to skin. The model is mounted on a base and includes a key identifying 46 structures.